The College of Veterinary Medicine nominated 18 individuals for three different staff awards. Front row, from left: Erin Wilson, Lesa Reves, Mal Hoover and Sandy Roten. Middle row: Debra Richie, Susan Hazelbaker, Jen Panzer, Christine Hackworth, Ashley Lignitz and Rosa Collazo. Back row: Gina Scott, Vicki Smtih, Gail Eyestone, Kristina Wyatt and Joe Montgomery. Not pictured: Barb Self, Erica Blackwell, Brandy Nowakowsi, Stephanie Hober, Eric Herrman, Xiaorong Shi, Addison Adams and Cassidy Goering. Eight staff members in the College of Veterinary Medicine have the distinction of being the first recipients of a new group of awards that highlights collegiality and compassion. 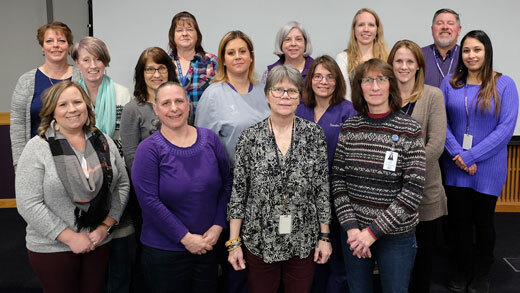 "The CVM Staff Council was established in 2017 to represent all unclassified and university support staff of the College of Veterinary Medicine," said Gina Scott, computer information specialist and chair of the Staff Council. "One of the first areas of development identified by the council was the overall recognition of staff for their contributions to the mission of the CVM." "We were so excited to implement this creative initiative designed by Staff Council," said Bonnie Rush, interim dean of the veterinary college. "It was a privilege to honor hard-working and committed staff through these inaugural awards. There are many deserving staff working throughout the college — we intend for these awards to become a time-honored tradition." Scott said one way the council chose to recognize staff is through a Staff Awards program, which was created in 2018. "This year we presented eight awards in three categories: High Five Award; Culture, Collegiality and Compassion Award, and Commitment to Excellence Award," Scott said. "In the first year, we had 18 nominations for these awards. The nominees and awardees were honored at a luncheon provided for all CVM staff on Jan. 30. Staff Council encourages everyone to start thinking about nominations for next year to keep this program growing." High Five Award: Barb Self, clinical services assistant at the large animal desk in the Veterinary Health Center. Presented to an employee who has gone above and beyond in enhancing one or more components of the College of Veterinary Medicine's mission of exceptional teaching, impactful research, outstanding service, extraordinary graduates. Culture, Collegiality and Compassion Award: Christine Hackworth, veterinary nurse in the exotics and dermatology sections of the Veterinary Health Center. Presented to an employee who enhances a feeling of belonging for all of the College of Veterinary Medicine and creates a more inclusive environment while enhancing the College of Veterinary Medicine's mission of Exceptional Teaching, Impactful Research, Outstanding Service, Extraordinary Graduates. Commitment to Excellence Award: Presented to six employees who have gone beyond in enhancing one or more components of the College of Veterinary Medicine’s mission of Exceptional Teaching, Impactful Research, Outstanding Service, Extraordinary Graduates. Brandy Nowakowski, administrative assistance in diagnostic medicine and pathobiology. Susan Hazelbaker, agricultural technician in small animal care in the Veterinary Health Center. Stephanie Hober, grants specialist for Center of Excellence for Emerging and Zoonotic Animal Diseases. Ashley Lignitz, human resources professional in the business office. Mal Hoover, certified medical illustrator in Computing and Technical Support. Erica Blackwell, veterinary nursing supervisor in the Veterinary Health Center.